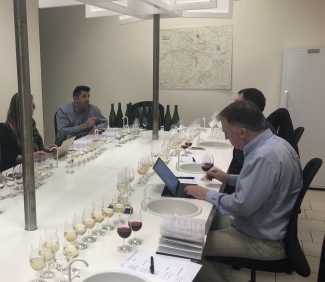 Our first taste of the 2017 vintage took place at Champagne Palmer & Co. Founded in 1947, the previous harvest marked the 70th anniversary for this most famous Champagne cooperative and we met with Chef de Caves Xavier Berdin, Managing Director Remi Vervier and the UK Brand Ambassador Arthur Camut to find out if it was a year worth celebrating. “A special harvest… quite difficult,” Vervier began. “Sorting [of the grapes] was key this year. It is not so common in Champagne, but in 2017 very necessary,” he told us. The technique he is referring to – grape sorting – takes place during harvest. By manually eliminating undesired grapes in the vineyard (unripe or rotten ones), the quality of the resultant wine can be improved – however it is an intensely manual task that involves considerable skill. “Put simply: if you can eat it, you put it in the basket – if you cannot, you let it go”, Vervier said. As a 50-55% Chardonnay house, the white grape is very important to Palmer and so this is where we began our vins clairs tasting. Fortunately for Palmer, the Chardonnay of the Montagne de Reims (where they source the majority of their grapes) was of good quality, even though yields were low. Chardonnay from these villages is typically more tropical, closed and complex. However, the still wines from 2017 that we tasted were smoky, generous and rich! 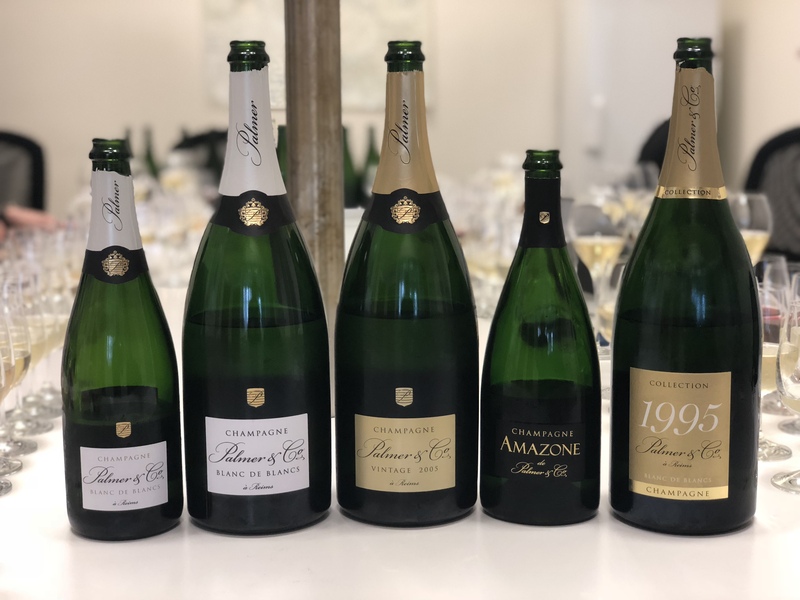 Alongside their Chardonnay soléra (a blending of reserve wine that has been both continually drawn from and added to for 25+ years and is used in the dosage for all cuvées), we also tasted the Blanc de Blancs assemblage which had already been blended. With 75% from the Montagne de Reims (Trépail and Villers-Marmery) and 25% from the Côte des Blancs (Barbonnes), this was an impressive blend – one that Essi Avellan referred to as “always on a vintage level”. 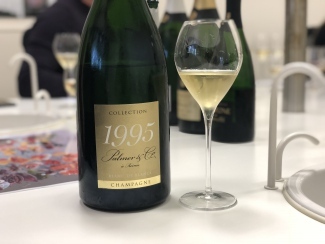 (Although technically a vintage champagne – it is always produced using wine from one harvest – Palmer Blanc de Blancs is released as a non-vintage champagne). Lots of fresh apple and grapefruit – nice and clean. Good texture and seems quite saline at this point. A lot of ripe pear and green apple. Very clean and fresh, acidity very dominant. Quite closed on nose but great texture on the palate. Very smokey and toasty. Rather lovely and refreshing. Bone dry seems to have tannins. Quite full already. Some smokiness and lots of pear and apple. The Barbonnes fruit character comes the most dominant on the palate. Moving onto the black grapes, Vervier commented: “It was not the same for Pinot Noir [as Chardonnay] in 2017.” Due to difficult weather patterns in the Montagne de Reims, the quality of the black grapes suffered. However, of the Pinots we tasted, Les Riceys was a standout. Although apparently the first village to see botrytis (in mid-August), the low rainfall that followed meant any existing rot disappeared. Again, we tasted the Pinot Noir soléra (this time 9+ years old, with 15-20% refreshed every year) and the Blanc de Noirs blend. The assemblage is sourced from the following regions: 25% Montagne de Reims Grand Cru, 25% Montagne de Reims Premier Cru, 25% Aube and 25% Vallée de la Marne and the 30% reserve wine content is always a blend of the previous two years. 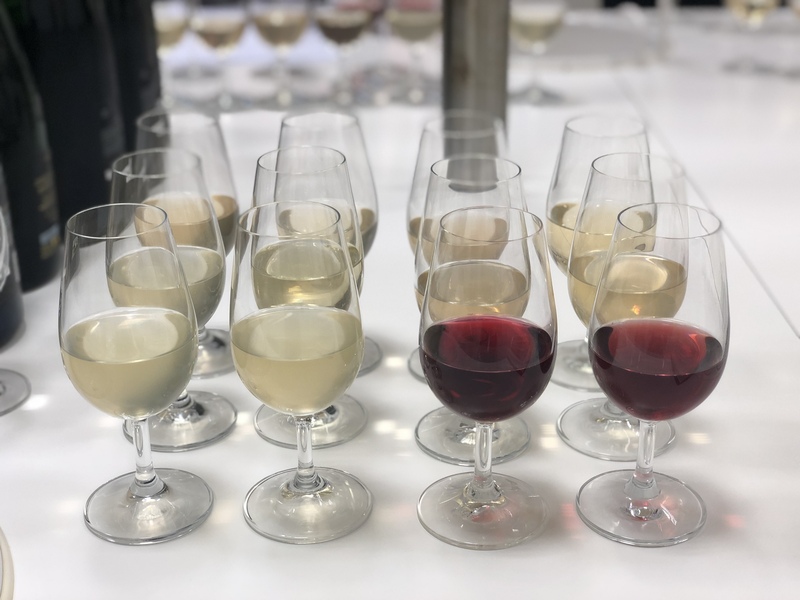 “With vintage, we choose closed wines that will develop in time, however with non-vintage we are looking for expression now,” Vervier explained. Some upfront red fruits. Lots of plum, apricot and peach flavour. Very rich and powerful – quite bold. Ripe apricots, red berry and much more of that leanness and chalkiness. Wow, great mouth-feel and such spice. Rather rich, like a ready to drink still wine. Lots of red fruit, like raspberry and red currants. Great wack of acidity and balance with chalkiness giving if great texture. A bit apricot with hints of honey. A little light mid-palate. But lots of lovely red fruits, mostly strawberries. Rich berry aromas, lots of raspberry and strawberry and strong mouth-feel. Has some salinity and hints of peachiness. When you go back is very expressive. Very good. Finally, we tasted a sample of Palmer & Co red wines. Comparing the technique in Champagne (where wines stay in vats for just one week) with Burgundy (where wine spends two weeks in vats) Vervier said: “The result is a fruity, elegant red wine, with not a lot of tannin.” Palmer have been working hard on their rosé for the last five years, focusing on two key areas: 1) Finding more expressive and fruity red wine, and 2) Calculating how best to refresh the soléra and use the perfect percentage. They have a new red winey in Les Riceys to work on the fruit forward character of their red wine and believe refreshing 20-24% of the soléra each year and using 8% in the blend are the magic numbers. Has great extract of fruit, rich, ripe red fruits, reminiscent of a good year in Beaujolais. Big bundle of spice and leather. Great power of red currants and strawberries. In summary, the 2017 harvest was a difficult year for Palmer & Co. The Montagne de Reims (where Palmer source the majority of their grapes) succumbed to a wet and humid summer of hailstorms, which allowed botrytis to hamper the potential of many vineyards. However, some areas performed surprisingly well. The generous and rich Chardonnay from the Montagne de Reims – which is not normally of such importance – rendered the Blanc de Blancs blend possible. The white grapes from the Côte de Sézanne – one of the few areas to see no adverse weather last year – was also of a good quality, although yields were low. “It lacks the power and acidity for a vintage but we are happy with the still wines. It would not be the same without sorting. A great year for education”, Vervier concluded. 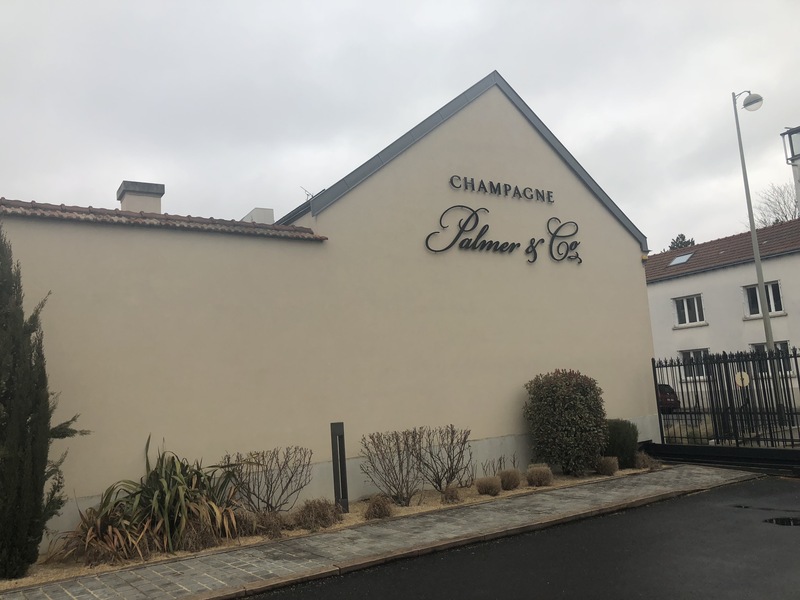 To finish our visit, we tasted a selection of Palmer & Co finished champagnes, including a comparison of Blanc de Blancs NV from bottle and magnum and the very rare Vintage 1995 Collection. Has a lot of upfront creamy character, loads or ripe apple, pear and yellow plum with bright but balanced acidity, great mouthfeel. Great length and saline and hint bitter finish.